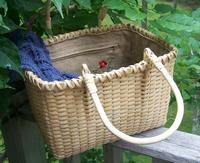 I received the beautiful knitting basket I ordered from the KR Boutique. It is perfect, just perfect. Delicate, yet sturdy, the way a good basket is meant to be. All the little details, from the wheat-colored embroidered lining down to the matching zippered pouch that was concealed inside the zippered pocket of said lining, made me giddy. What to put in this delightful thing? Knitters don’t become faint in the presence of inspiration; we take action. I was inspired forced to sort through some of my other baskets and their overflow, and I am shocked at what I found. Well, not so much shocked. I know me. So I spent an hour or so untangling little messes, muttering, discovering long-lost needles and patterns, and — here, I knew it was bad, but this bad? — making a pile of knitting. I can’t even call them WIP’s. It was a pile of knitting, plain and simple. I had to face it. What is going on here? As I said, I know me. I start things when I’m antsy. I’m looking for ways to soothe, or solve, or settle. I cast on, knit until the world calms down, and I’m fine. Or, I knit until I am frustrated and wild-headed; I wasn’t going to be fine in the first place. The result: a pile of knitting. Either way, all these bits and tangled and sometimes beautiful things are Jane. One day I’ll tell you a sweet story about my mother and her “Janes” but it will have to wait until I have knitted or written my way out of this bloggy shyness. Here is my recipe for a good kind of solitude: It’s a dark, foggy, humid, hot day, but my AC is on; I have the day off; I have exactly two errands to do; I rented a bunch of episodes of “Prime Suspect”; I have blueberries; I have endless knitting possibilities (see above). Ha! Preaching to the choir, babe, preaching to the choir…I have so many projects I’ve started, it kills me. I saved myself from starting another this weekend, but just barely, because I forced myself to swatch (which means “Permission to rip out after a square is knit”) so I got that back into a ball before it qualified as POK… but man, do I have more than my fair share of that. I barely finish anything at all, but I knit all the time! How is that possible? Oh, for a day like the one you describe! I get in a row here and a row there — one full day to knit (in the A/C) and watch movies without worrying about the boys, the laundry or the dog. There’s a picture down a few posts, but it’s of the beginning. I have a bout 2 feet done now. That’s it poking out of the beautiful basket. thank you.. thank you.. i feel better (esp since my post Ive discovered other items. truly lost items..) so who knows. perhaps I have something similar to narcolepsy or cleptomania.. yes! that’s it.. I stole time and cast on while I was alseep! but what would I call that? ?